FC Blackwater's Last Resort - "Finn"
Elite's Flippin the Lean Grade JH - "Lexi"
Daughter of NAFC FC AFC Cody Cut a Lean Grade - "Grady"
FC Finn was born February 18th, 2006, and is known for being a game day player. As a young dog, he was very consistent in the qualifying and finished that stage of his career handled for a win by owner Bob Swenson. Finn made the step to the all-age stakes and won two opens in 3 weekends, earning him his FC title and qualifying him for the 2009 National Open. Finn has OFA ratings of good hips, normal elbows, clear eyes and normal cardiac. He is clear EIC, CNM, PRA and Narcolepsy. Lexi JH is the direct daughter of NAFC FC AFC Cody Cut a Lean Grade - Grady. She is hard-charging, lovable, family orientated, with a high desire to please. 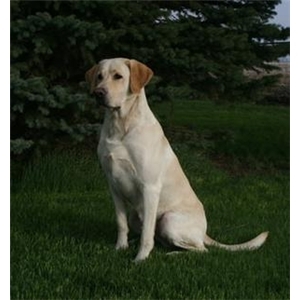 Lexi raises very healthy pups who have proven to perform in the field. Lexi has OFA ratings of good hips, normal elbows and clear eyes. She is also clear of EIC and CNM. Pups are up to date on shots, dewormed, dewclaws removed and microchipped. Litter had ENS, is well-socialized, and had extensive exposure to various controlled environments, as well as noises, birds and beginning obedience. Litter located in Rupert, Idaho. Shipping available at buyer's expense. Additional pics and video in comments. Please contact Chris @ 208.914.8524 or chris@gundogranch.com with any questions.